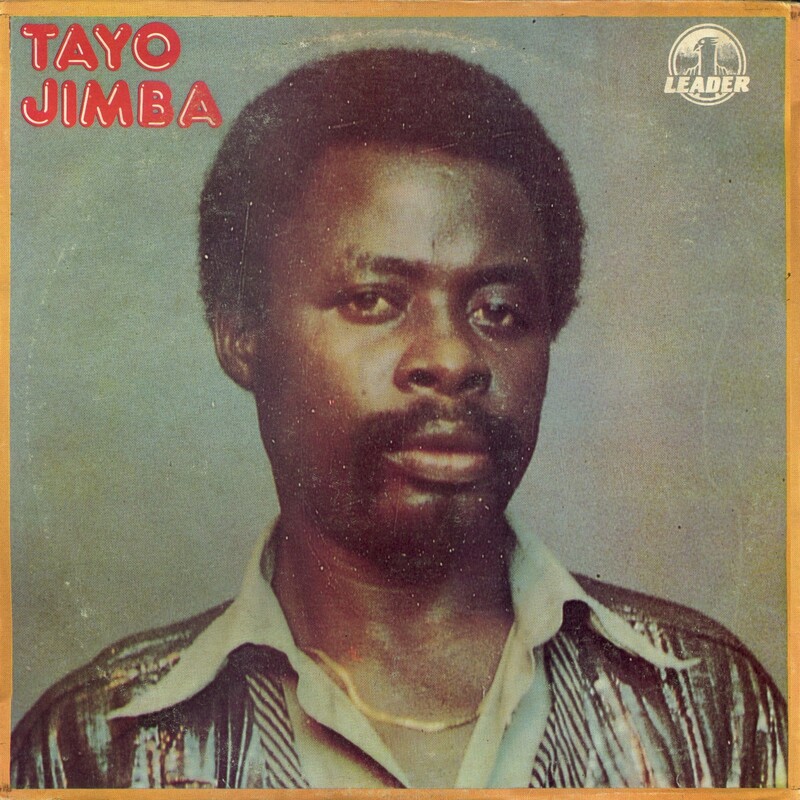 Who is Tayo Jimba? I have no idea. 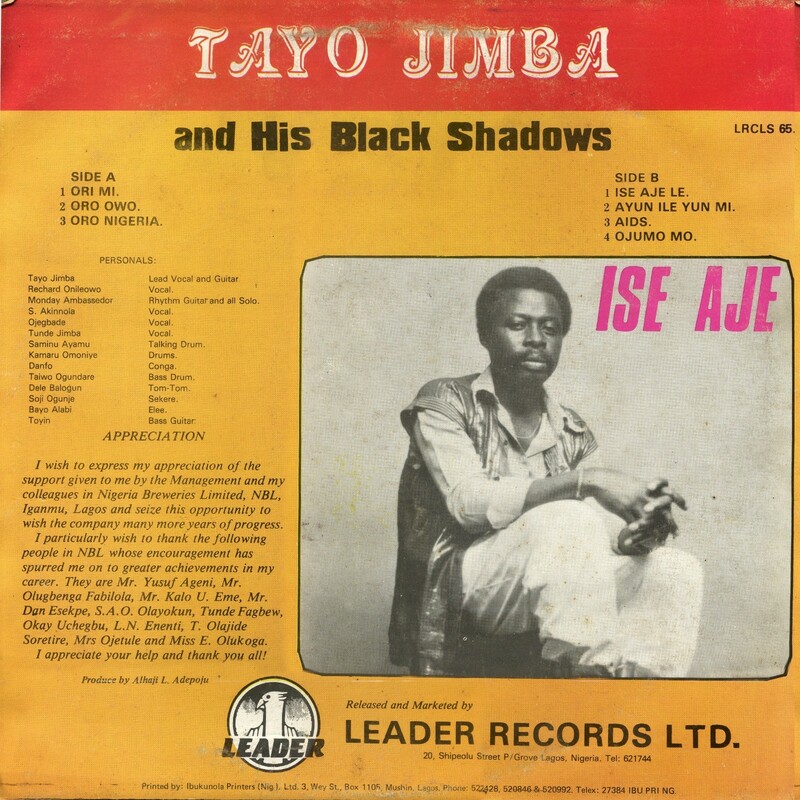 I do know that I enjoy this 1988 LP, Ise Aje (Leader LRCLS 65), a great deal. The label lists the musical style as "Jùjú/Highlife," and that sounds about right. 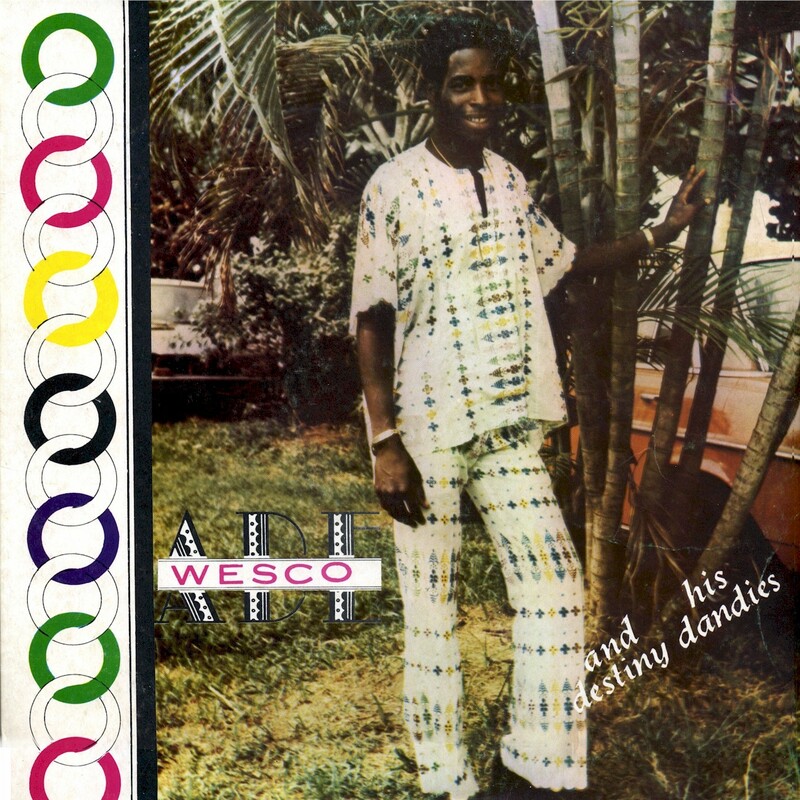 It is actually quite similar to recordings I've posted here before by Adé Wesco and Orlando Owoh - a funky, rootsy, less-cluttered sound that takes us back a few decades to the point where jùjú and highlife music were less differentiated. 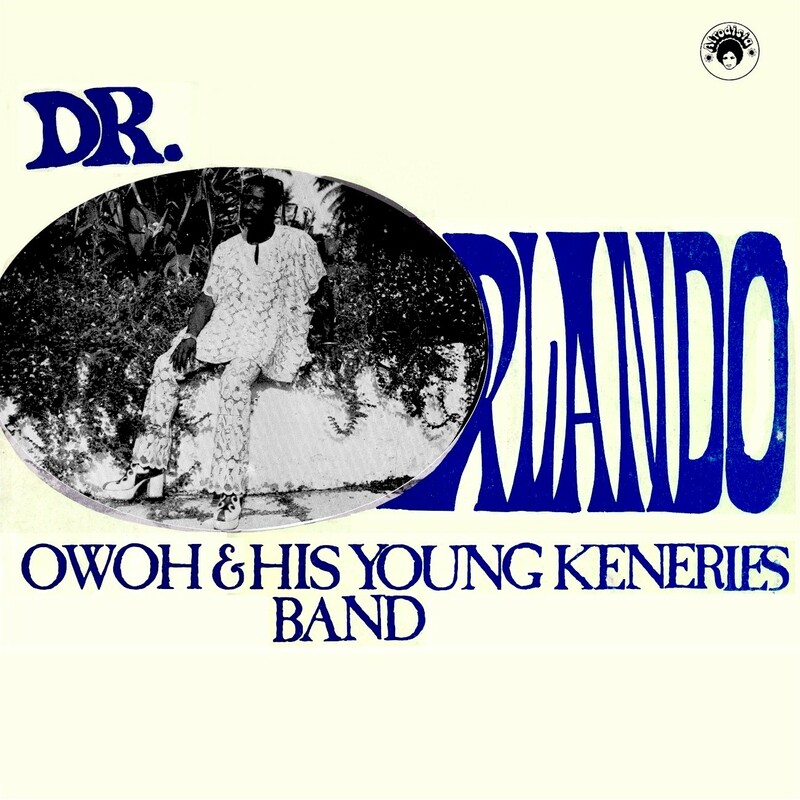 The label also lists the language as "Yoruba/Ikale." 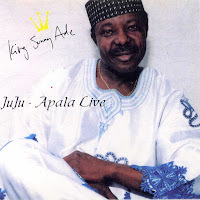 Ikale is generally considered a dialect of Yoruba rather than a separate language, and since Ikale speakers are concentrated in Ondo State, western Nigeria, it's reasonable to surmise that Tayo Jimba is from there also. Reader/listeners are invited to tell us more. Download Ise Aje as a zipped file here. 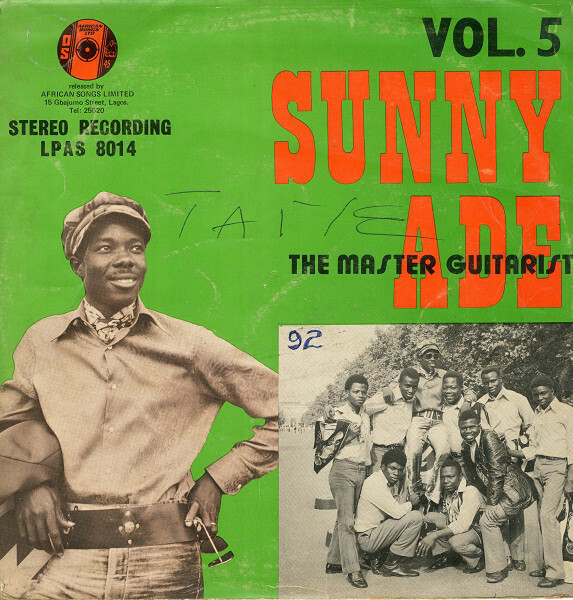 I've been collecting Nigerian music since the 1970s, but never actually made it to the country until 1994 and 1995. By then it was apparent that the music industry was going through a crisis, or at least big, big changes. The Nigerian affiliates of the two international record companies, Polydor and EMI, had been sold off and changed their names to Premier Music and Ivory Music respectively, while Afrodisia, formerly Decca West Africa, had gone inactive. A few LPs were still being pressed, but most "official" music distribution was via low-quality cassettes. The industry was suffering a death by a thousand cuts as pirated cassettes swamped the market. 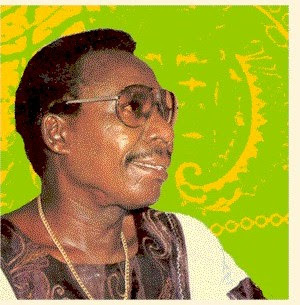 By the mid-'90s in southwestern Nigeria jùjú music had been eclipsed by fújì and other styles, as I've discussed earlier. 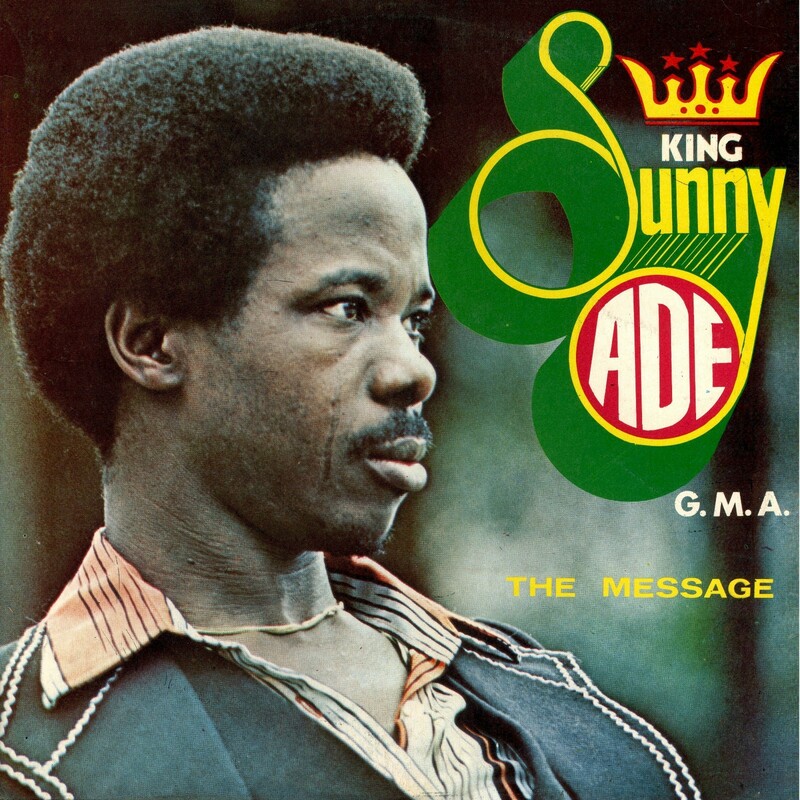 King Sunny Adé and Ebenezer Obey were still on the scene, though with lower profiles. 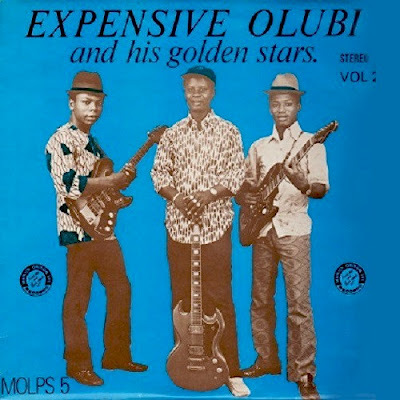 Their more laid-back, philosophical brand of jùjú had given way to a frenetic, materialistic version, epitomized above all by Sir Shina Peters, who sang of the good life and conspicuous consumption. 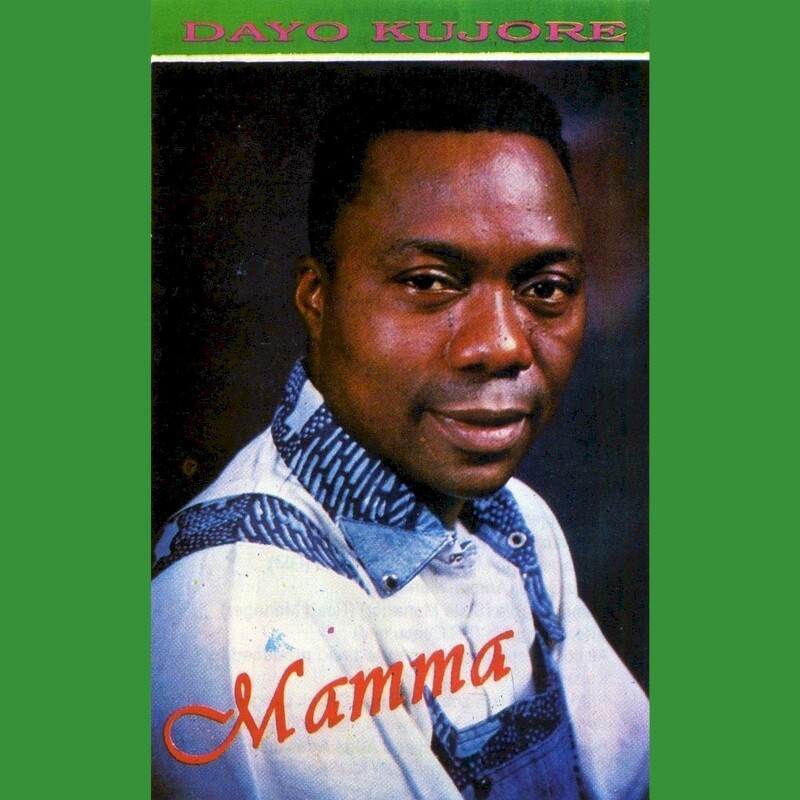 "Wonder" Dayo Kujore, born in 1958, is another exponent of the new jùjú sound. Like Shina Peters, he served his apprenticeship in the band of Prince Adekunle, playing lead guitar on some of the maestro's biggest hits. 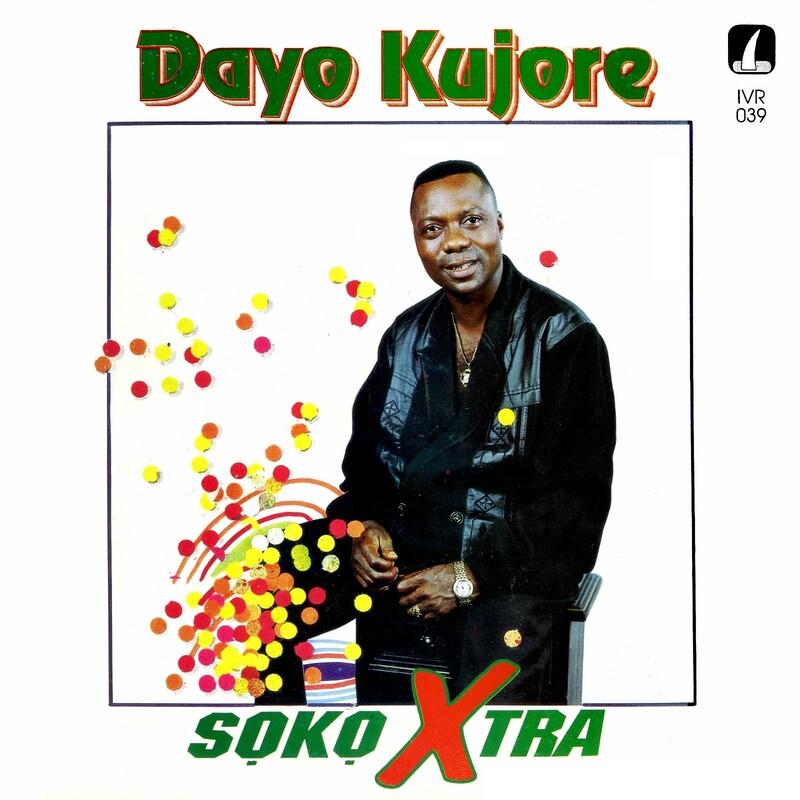 Kujore soon left to form his own group, but it wasn't until the early '90s that he really made a mark with albums like Super Jet, Easy Life and today's offering, 1993's Sọkọ Xtra (Ivory Music IVR 039), one of his biggest hits ever. The basic elements of the 1990s jùjú sound are all here: the punchy, forward-driving rhythms complete with electronic drum pad, synthesizers and no pedal steel guitar to be found. And check out the Paul Simon reference in the opening bars of "Eko Ayo!" I've always preferred "Old School" jùjú myself, but newer productions like Sọkọ Xtra have their attractions. Enjoy! Download Sọkọ Xtra as a zipped file here. 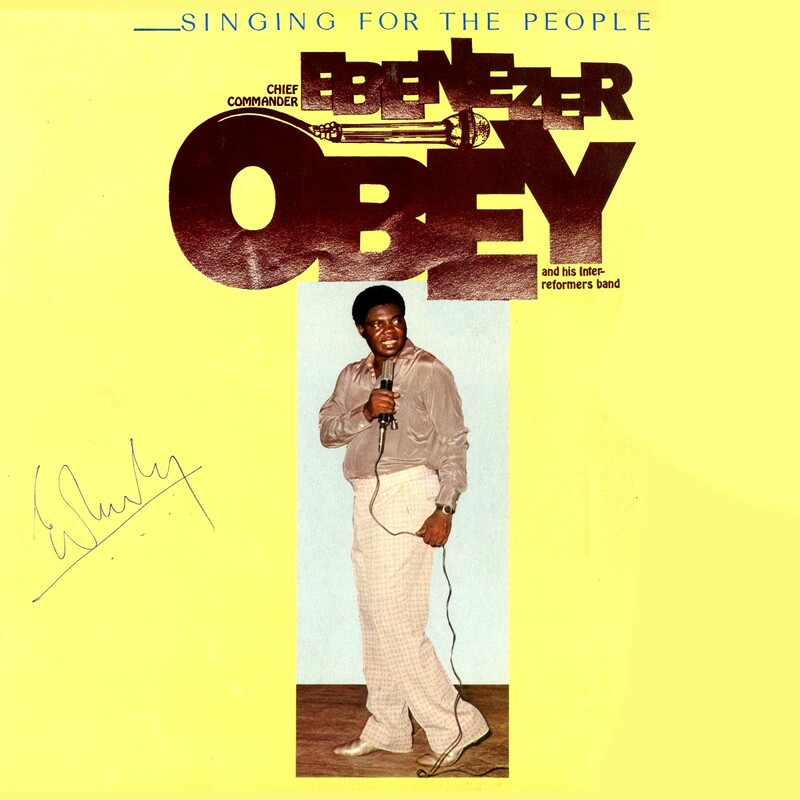 I hate to say this, but it's been ages since Ebenezer Obey has waxed anything worth listening to. For the last twenty years he's been devoting himself to spreading the Gospel, only occasionally setting foot in a studio to record something of a religious nature. Not that I'm putting that sort of thing down, of course. 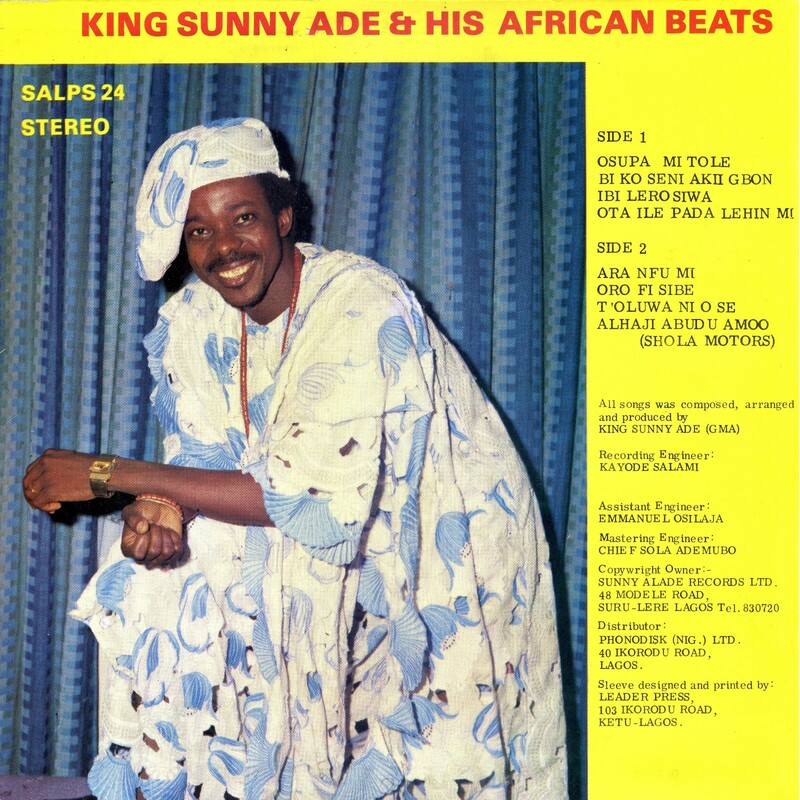 It's just that I miss the days when the Chief Commander was on the cutting edge of jùjú music, notably with a series of LPs in the early '80s that combined deep Yoruba roots music and funky R&B influences. 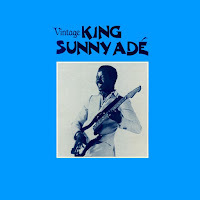 "Oba Sijuade" comemmorates the coronation in 1980 of Alayeluwa Oba Okunade Sijuwade as the Ooni of Ifè, one of the foremost traditional leaders of the Yoruba people. Legend has it that at the site of the present-day city of Ile-Ifè the supreme being Olódùmarè directed the creation of the world. The god Obàtálá created human beings out of clay, while the god Oduduwa became the first leader of the Yoruba nation. 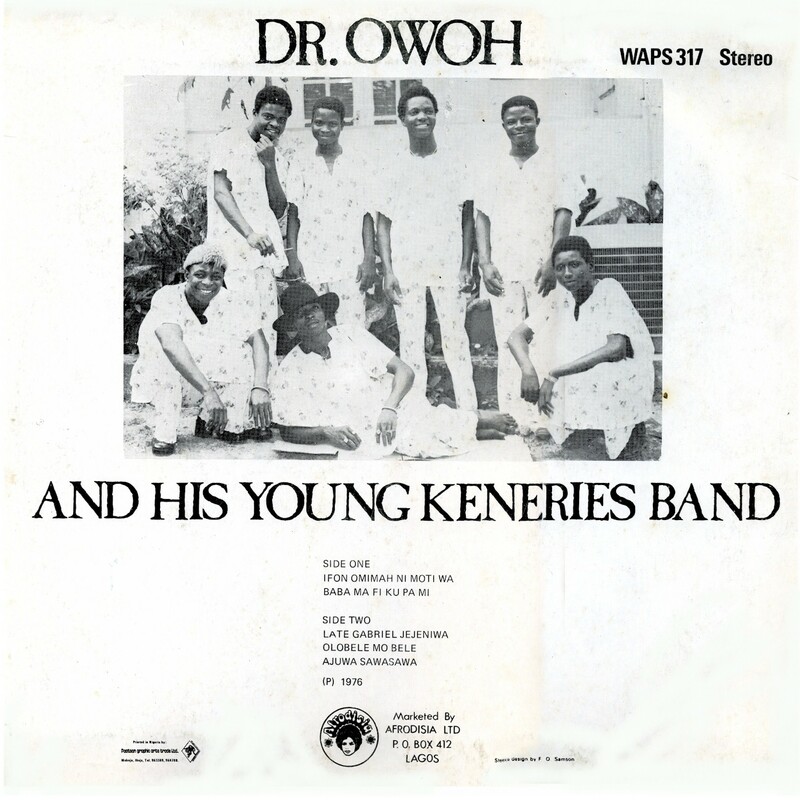 It is said that all of the succeeding Oonis are direct descendents of Oduduwa. 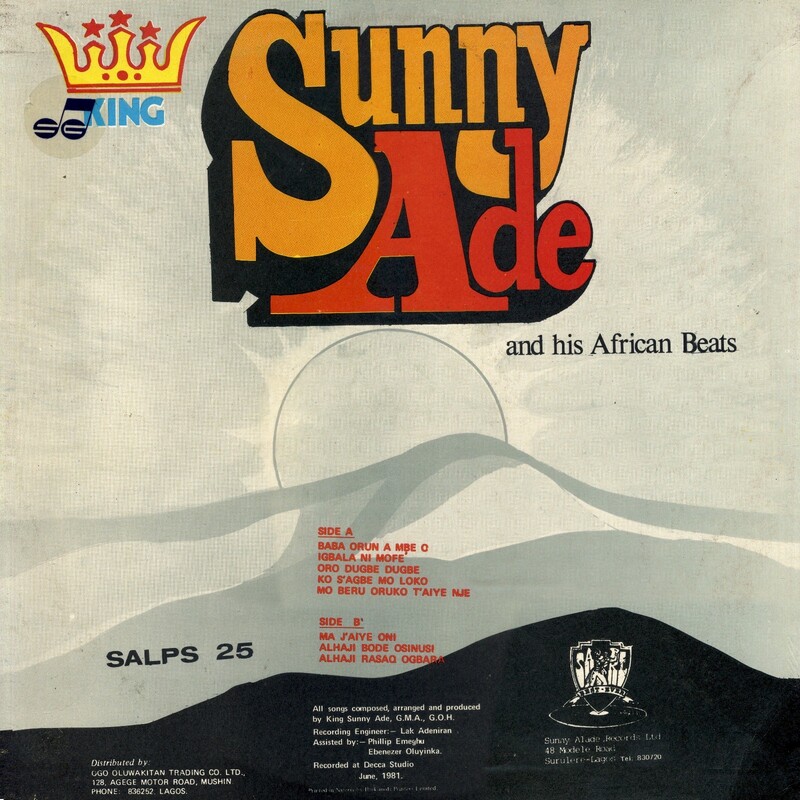 In his 1969 release On the Town (Decca WAPS 28), Obey also paid tribute to then-prince Sijuade. Download Current Affairs as a zipped file here. In the course of researching this post, I was saddened to read of the death on August 23 of Juliana Olaide Obey-Fabiyi, Ebenezer Obey's wife of 48 years. I'm sure everyone reading this will join me in offering Mr. Obey their deepest condolences. 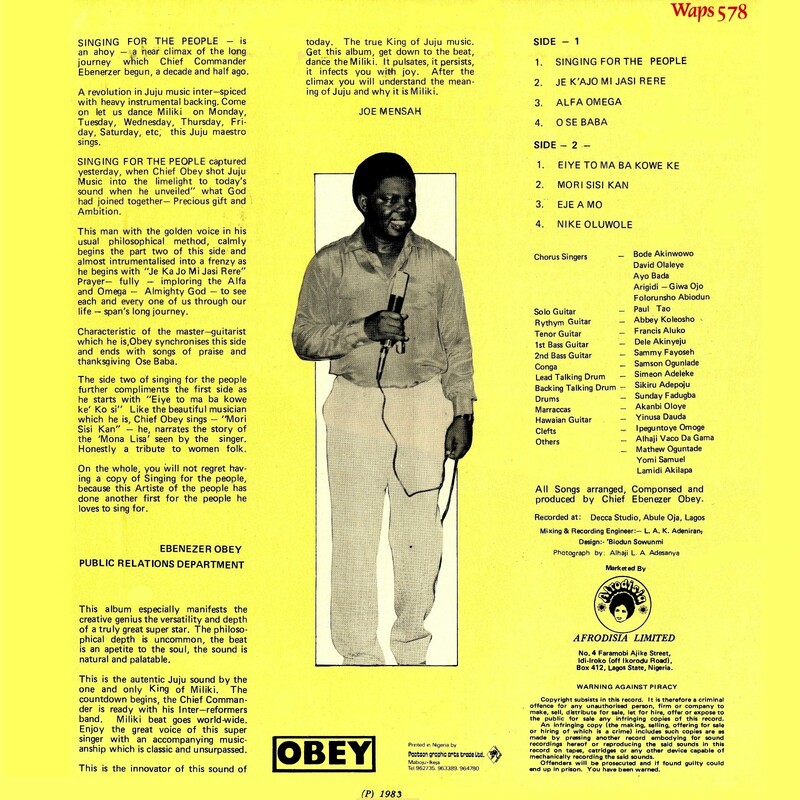 As I promised, here is the second installment of ground-breaking classic jùjú by the great Ebenezer Obey, his LP On The Town (Decca WAPS 30, reissued as Obey WAPS 30), recorded in London in 1970. 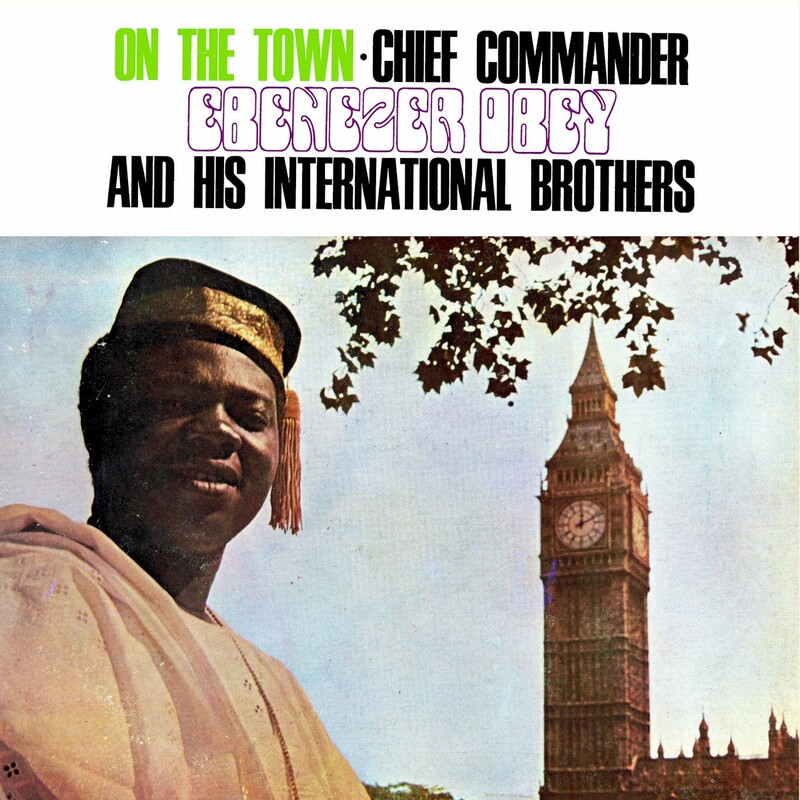 Here we find the Chief Commander and his International Brothers stretching out with a non-stop medley on Side 1. 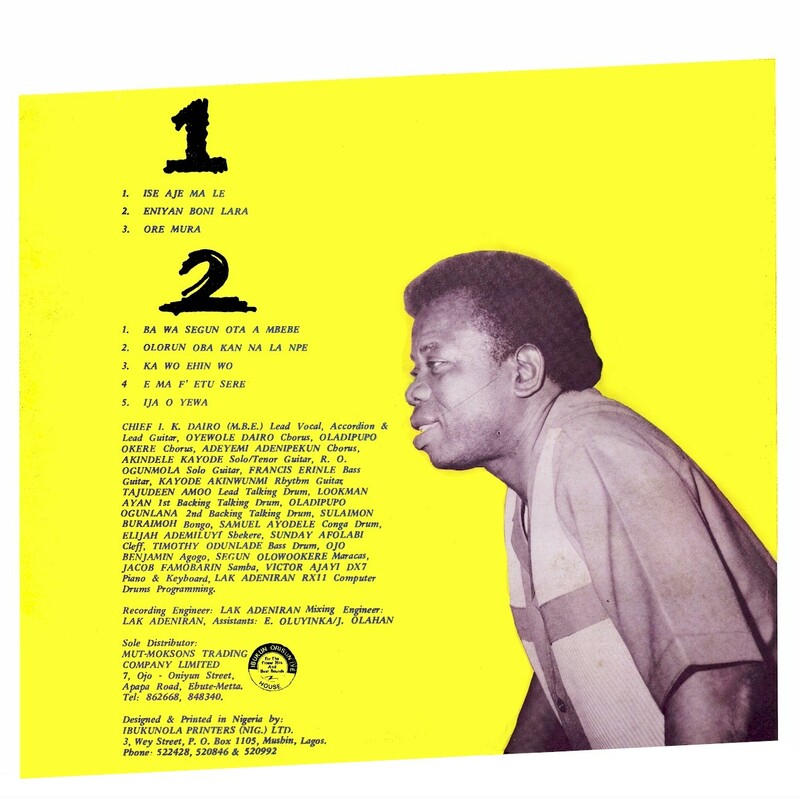 Side 2 features two extended cuts. I especially enjoyed the highlife "Ajoyio/Ore Mi Maje Aja." For more information on the songs click on the picture below. Those of a certain age, like me, will remember when the Beatles first hit the international scene in late 1963. Within a few months Beatlemania swept around the world like a tsunami. We Beatlemaniacs (the male ones, anyway) soon divided ourselves into two factions: "Paul Men" and "John Men." Of course, all the girls were crazy about Paul McCartney, the "Cute Beatle," and "Paul Men" loved his bitchen' bass guitar that looked like a violin. "The Smart Beatle," John Lennon, didn't get as much attention at first. But while McCartney always had a way with the catchy melody, it was Lennon who contributed the most meaningful and insightful lyrics to the Beatles canon. He had a nuanced and cynical view of human nature that struck a chord with the youthful and rebellious. That's why, even though Lennon and McCartney complimented each other perfectly, and none of the work they did on their own ever equaled what they did together, I've always been a "John Man." I suspect that jùjú music fans similarly divide themselves into factions following King Sunny Adé and Ebenezer Obey (just for sake of argument, we will leave out of the equation I.K. 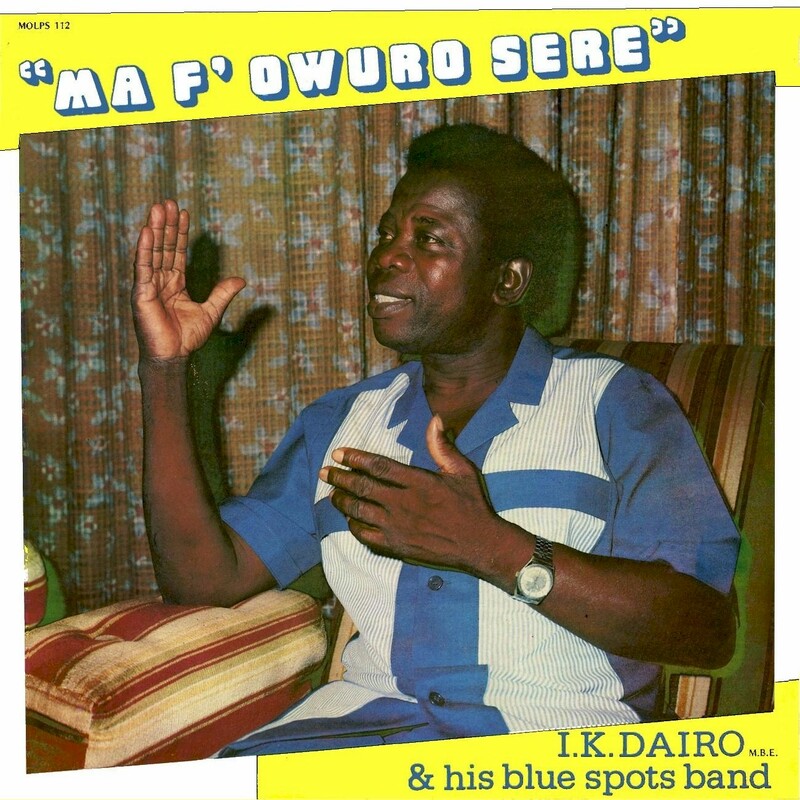 Dairo, Prince Adekunle and the like, much less the silly Shina Peters!). 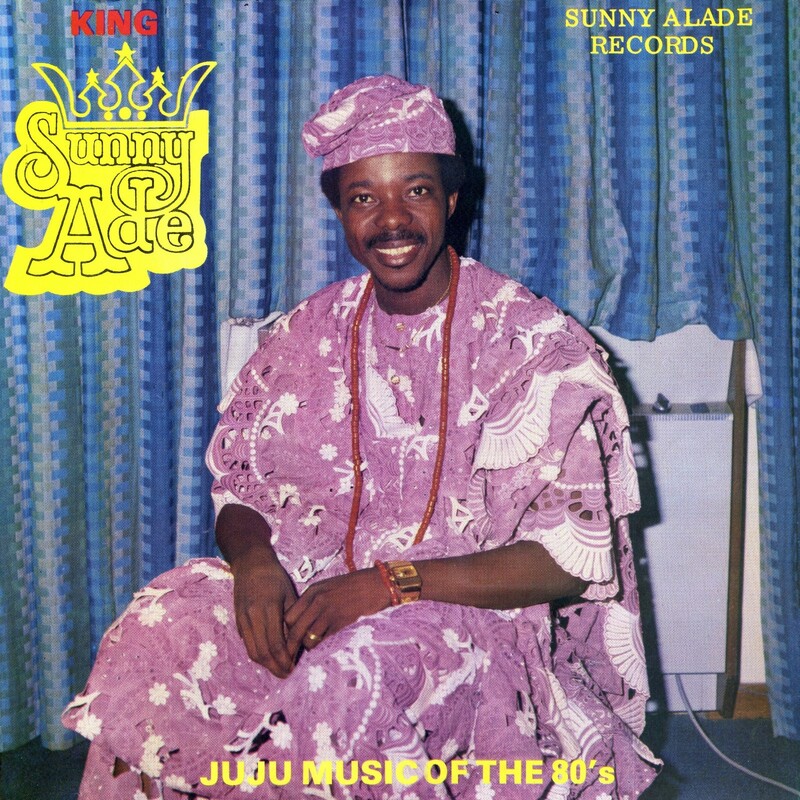 King Sunny Adé was the one who brought jùjú music out of Nigeria in 1982, when his LP Juju Music was released on Island Records, but of course he didn't create the style. 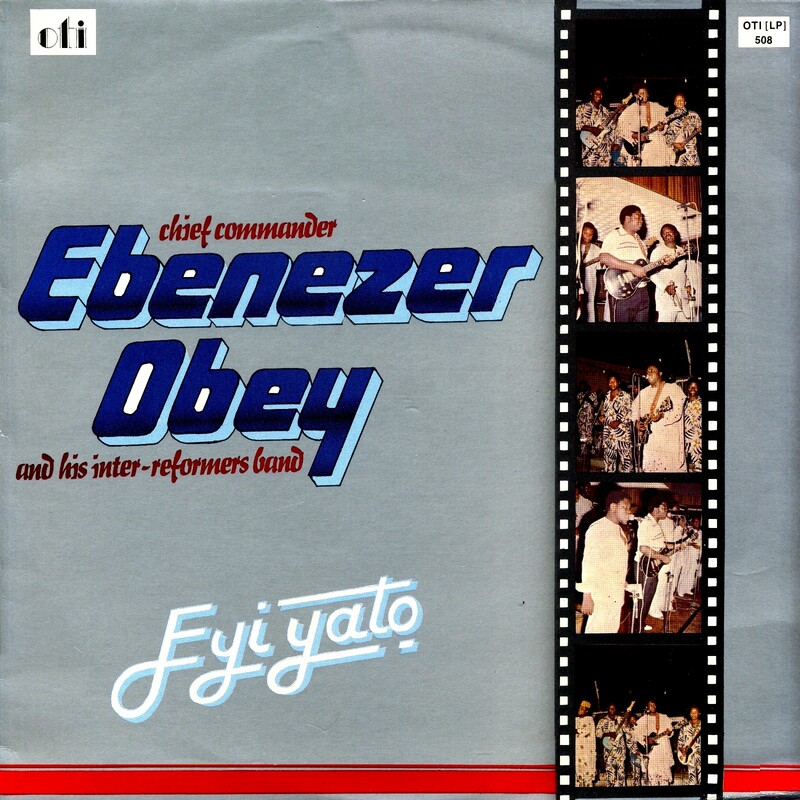 Nor did Ebenezer Obey, but he'd been playing jùjú since the mid-1950s, and founded his International Brothers Band (later re-named the Inter-Reformers) in 1964. 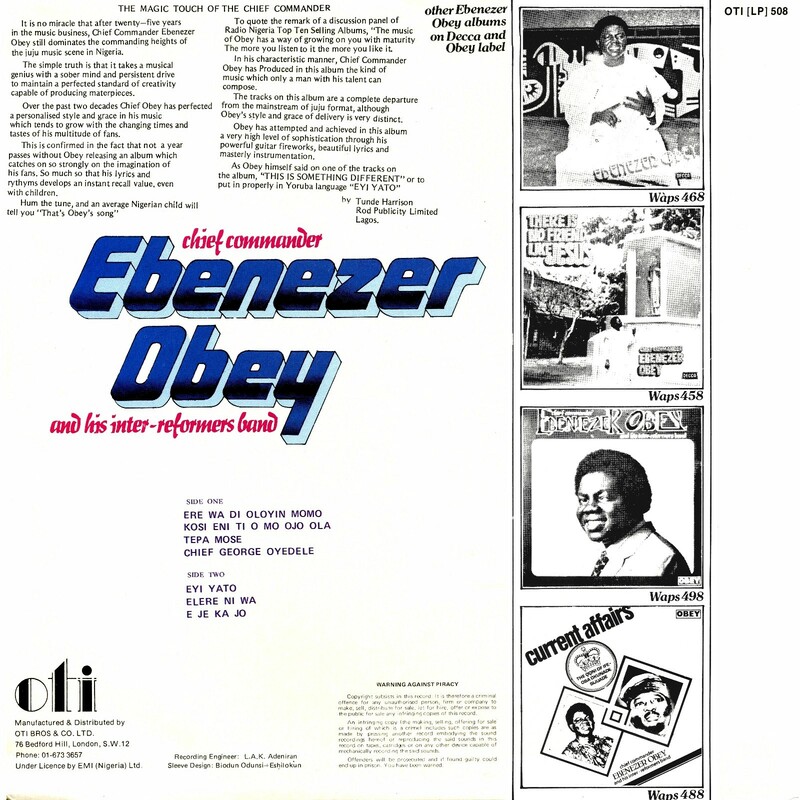 Following Sunny's initial success, there was a desultory attempt to market Obey to an international audience, and a bizarre record, Je Ka Jo (Virgin 205761) was released in 1983. A big glob of over-produced mush, Je Ka Jo had nothing to do with jùjú music as it was generally understood, and disappeared without a trace. 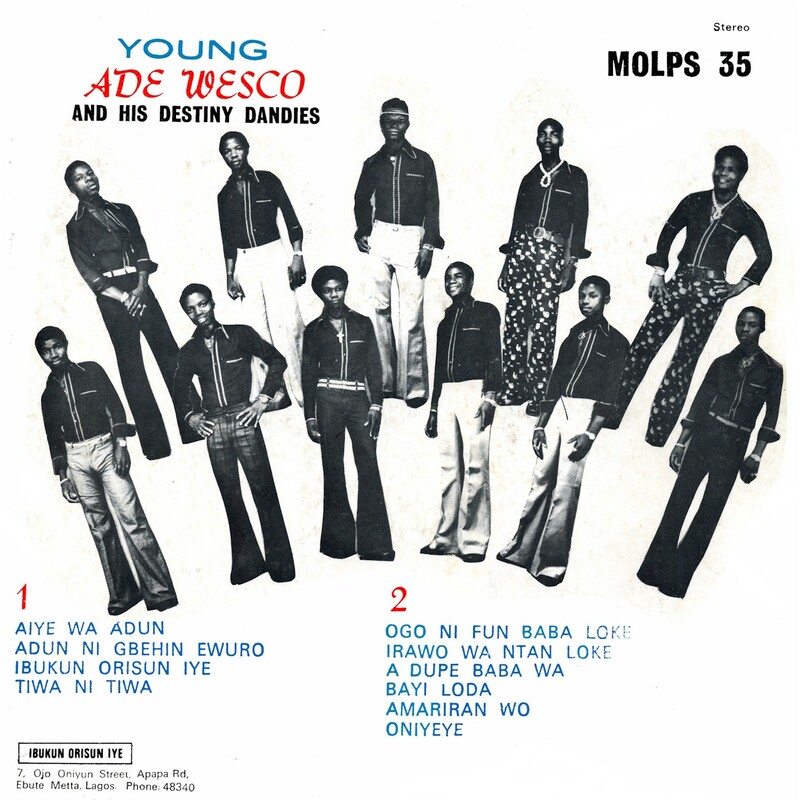 If Virgin Records had licensed some of Obey's great Nigerian releases like Current Affairs (Decca WAPS 488), Sound of the Moment (Decca WAPS 498) or Eyi Yato (Decca WAPS 508), they might have gotten somewhere. 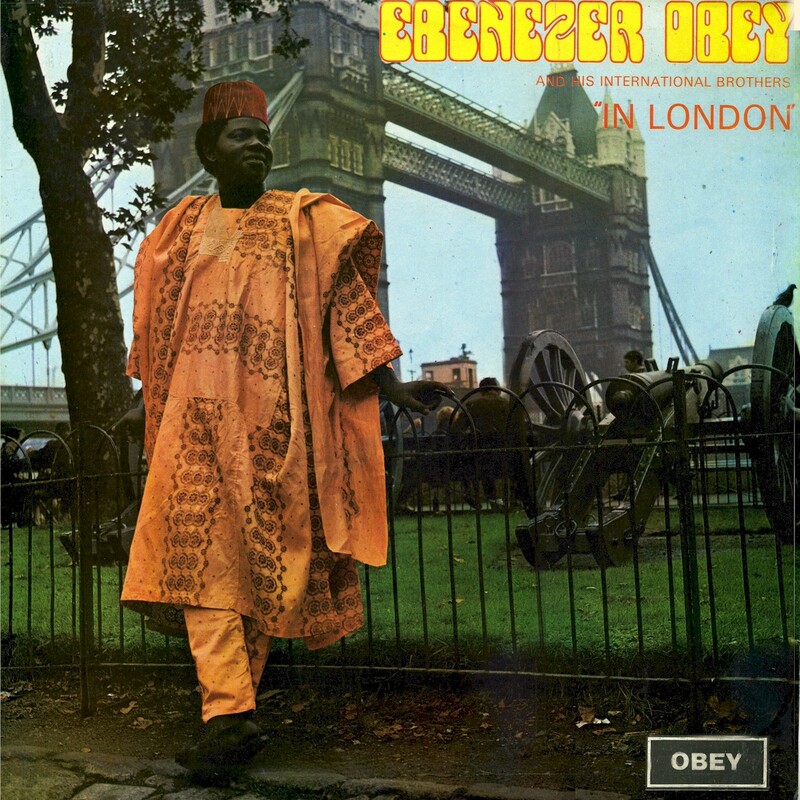 Those records, all released in 1980, with their soul-stirring Yoruba harmonies, mind-bending guitar work and echoes of American rhythm and blues, display the great Obey at the peak of his powers. 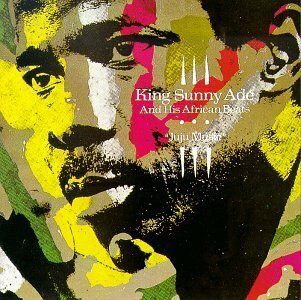 In comparison Sunny Adé, as good as he is, is just outclassed. That's why I'm an "Ebenezer man." 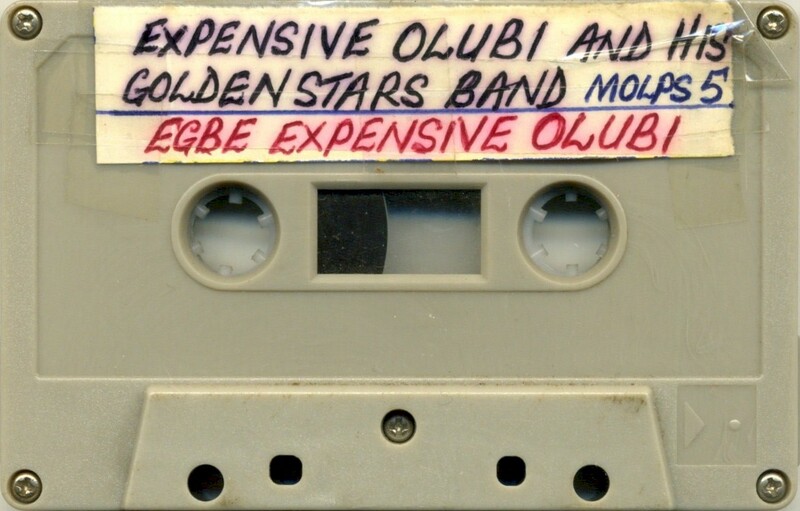 Nigerian fans have their own favorite recordings. 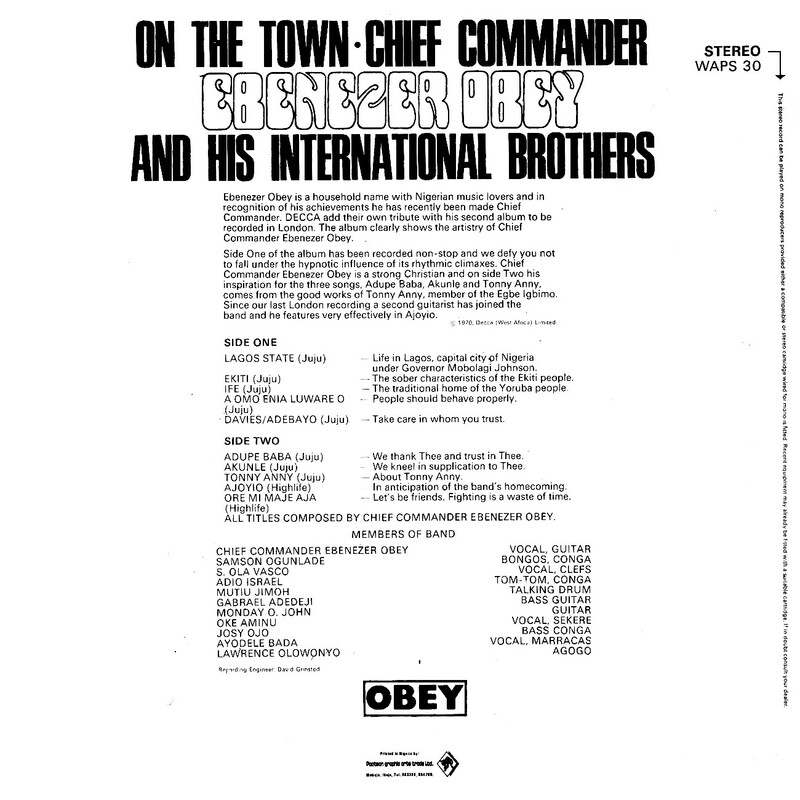 Board Members (Decca WAPS 38, 1972) is probably the most popular of Obey's early releases, while many swear by The Horse, The Man and His Son (Decca WAPS 98, 1973). 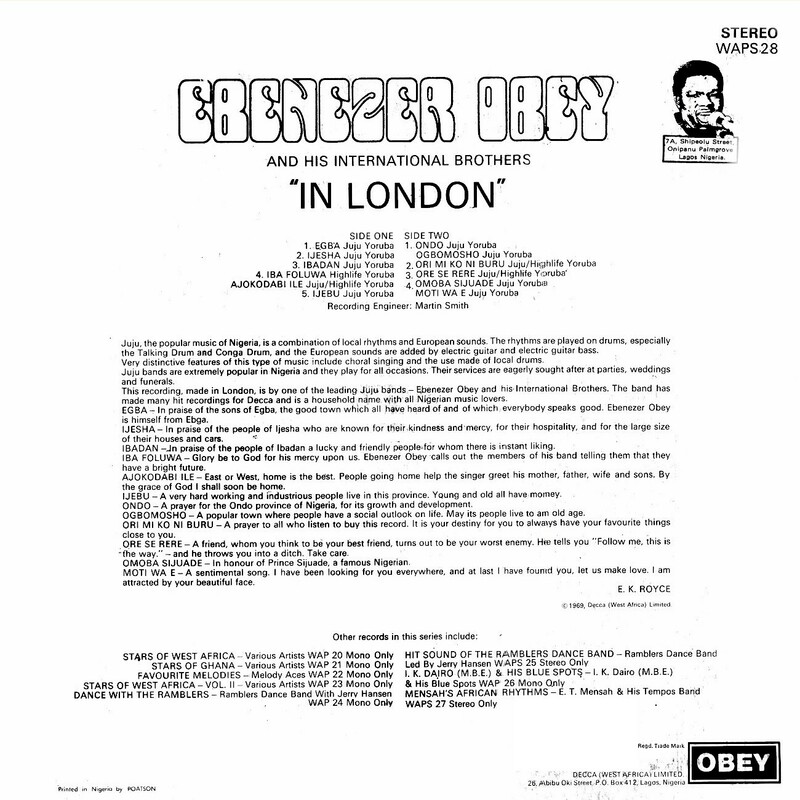 I myself have always been partial to two albums he recorded in London in 1969 and 1970, In London (Decca WAPS 28, later reissued as Obey WAPS 28), and On the Town (Decca WAPS 30, reisued as Obey 30). In the coming years Obey would adopt some of the innovations of the other jùjú musicians - pedal steel guitar and long, extended jams - but these albums are interesting for their blend of jùjú and highlife elements. Here's In London. Click on the picture below to read about the songs. When I digitize it, I will post On the Town here as well.